research on the etiology, prevention and treatment of pediatric obesity, using her expertise in methodologies such as nutritional assessment, accelerometer, indirect calorimeter, and doubly labeled water. Dr. Kelly's research is currently focused on the role of exercise in the prevention and treatment of pediatric obesity and metabolic disorders. 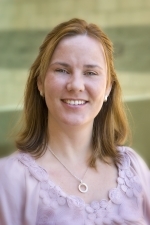 Dr. Kelly's research interest include Exercise for pediatric obesity and metabolic disorders, Nutritional assessment.